Scale and experience. Attractive risk-adjusted returns across market cycles. Antares’ success is built on a time-tested, credit-based investment approach. Chosen repeatedly to lead a majority of the transactions we finance, Antares realizes advantages in economics and more direct influence across investments. We also hold a large portion of each loan we originate on our own balance sheet, driving a unique alignment of interests with co-investors. With one of the largest senior loan portfolios in the middle market, coupled with market leading sourcing and selection capabilities, Antares is the right choice for institutional investors looking to add middle market private credit investments to their portfolios. 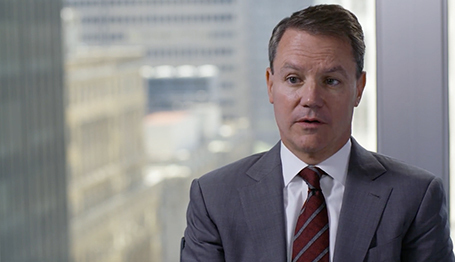 In an interview with PDI, Dave Brackett, Co-CEO and Managing Partner, discusses what investors should keep in mind when considering an investment in private credit debt. Antares has been entrenched in middle market private debt for more than 20 years. That experience translates into a unique perspective we are proud to share. In this special Pitchbook report, Antares provides its perspective on “The Global Financial Crisis…Ten Years on.” The article also includes a Q&A with with Head of Capital Markets Mike Chirillo and Chief Credit Officer Tyler Lindblad in which they discuss evolving credit markets following the global financial crisis and macroeconomic factors impacting middle market growth prospects. 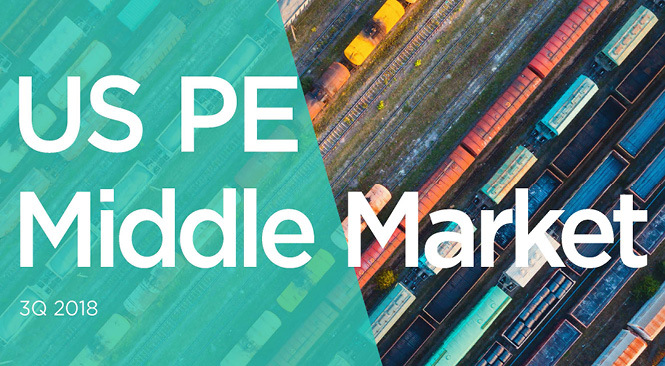 Timothy Lyne, Senior Managing Director, provides an update on the current middle market private debt loan market including recent activity levels, the health of the Antares portfolio and more. Has Private Debt Reached Saturation? 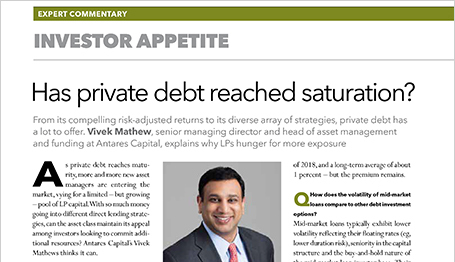 In a Q&A with PDI, Vivek Mathew, Senior Managing Director and Head of Asset Management, explains why LPs hunger for more exposure to private debt. 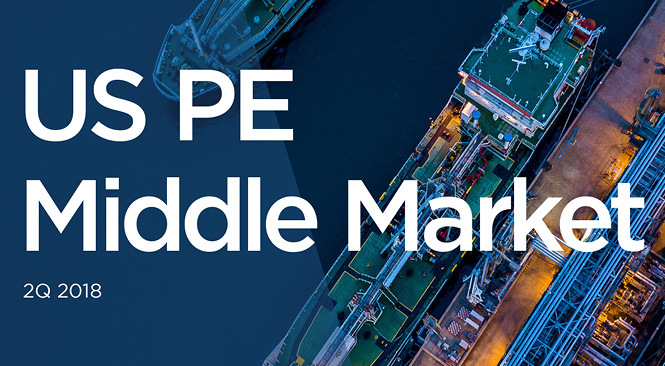 In this special Pitchbook report, Antares provides its perspective on the market including current optimism around the US economy and company earnings, as well as rising apprehension due in part to the prolonged cycle. The article also includes a Q&A with Co-CEOs David Brackett and John Martin. 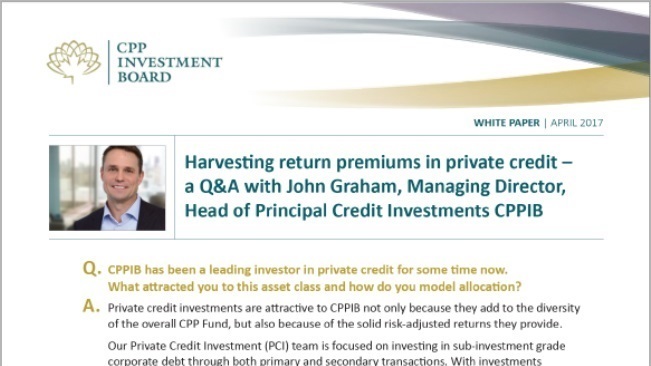 In this insightful interview, John Graham, Managing Director, Head of Principal Credit Investments, CPPIB, talks about the attractiveness of private credit. December 20, 2018 - Antares Capital Advisers LLC, a subsidiary of Antares Capital LP (together with its parent companies, “Antares” or the “Company”) announced the closing of Antares CLO 2018-3, Ltd., a $1 billion collateralized loan obligation (CLO). The CLO represents the fifth CLO issued by Antares, bringing the company’s total CLO assets under management to approximately $6 billion. August 7, 2018 - The Antares Bain Capital Complete Financing Solution (“ABCS”), a joint venture between Antares Capital LP and Bain Capital Credit, LP, today announced that it closed four unitranche transactions in July with new and existing borrowers totaling $794 million in credit facilities. May 16, 2018 - Antares Capital Advisers LLC, a subsidiary of Antares Capital LP (together with its parent companies, “Antares” or the “Company”) announced the closing of Antares CLO 2018-1, Ltd., a $700 million collateralized loan obligation (CLO). The CLO represents the third CLO issued by Antares, bringing the company’s total CLO assets under management to approximately $4 billion.